Remember when sugary cereals came with a toy in every box? 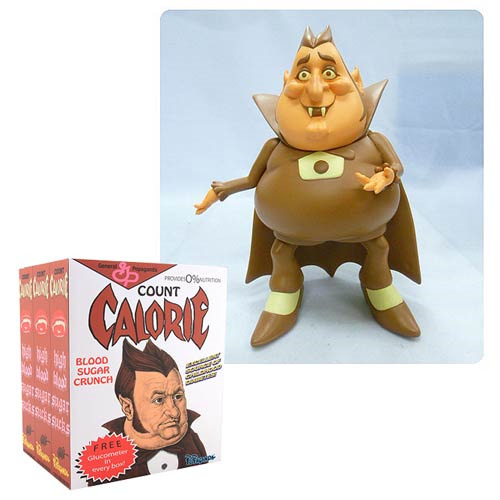 Count calorie is a Ron English-designed vinyl figure! Measures 8-inches tall and features articulated arms. One of the apostles of fatty goodness, this Count Calorie Cereal Killers Series Last Fat Breakfast by Ron English Designer Vinyl Figure harkens back to the days when sugary cereals captured the hearts of Young America by giving away cheap toys made in China in every box. Here, however, it looks like the prize at the bottom of the box actually ate the cereal! Count Calorie measures 8-inches tall and features articulated arms. Ages 14 and up.